Good grammar and a strong command of language will make your blog posts easy to read, but the trick to drawing readers in is to make them engaging. An engaging blog post is one that your reader connects with and wants to keep reading. Really engaging writing makes readers come back to your blog and share your content. This can make the difference between a small blog with a handful of readers to an immensely successful blog that's continually attracting more followers. Writing engaging posts, therefore, should be one of your top goals. When you're writing a lot of blog posts, it can be all too easy to slip into writing bland, emotionless content. But why are you going to waste your time writing posts that you don't care about, and that your writers inevitably won't care about either? A great blog post has some soul. When you can, write about something that you really care about, and work in your own unique voice, even if you fear it makes you sound less professional. You want your blog to sound like it's coming from a real flesh-and-blood person, not a computer. When you have something to say, don't shy away from expressing your opinion. If you're arguing something controversial, you may get some negative responses, but sparking a reaction is proof that you've written something engaging. Put yourself into your blog posts, and you can expect your readers to give something of themselves in return. Writing engaging posts has a lot to do with engaging readers' emotions. Emotions, more than facts and statistics, will help a reader to remember a post. When you're writing, think about what emotions you might play on in relation to your topic: excitement, happiness, hope, ambition, fear? Connect to these emotions and use emotion words to help your content engage with your readers. When you think about all the things you've read, which are the ones you remember? They're probably stories. One of the easier ways to include emotions and engage with the reader is to tell stories in your blog posts. Everyone loves a good narrative. Stories make your content easy to follow and help your readers to picture themselves in a particular situation. You can tell a story about your own personal experience, relate someone else's story, or ask your readers to imagine themselves in a particular situation. If you find you have a dry paragraph, adding in a short story is a great way to quickly make it more engaging. Try working your facts and statistics into stories to make them relatable. Think about it: you've probably been more moved by the story of a single cancer victim than you have by the many statistics about cancer. Use the same principle in your writing: use stories to move your readers. Writing a blog isn't the same as writing a Pulitzer Prize winning novel. Your goal should be to make it as easy to read as possible. This means keeping things short and simple. Your sentences should be short and avoid any overly complex vocabulary. If you have a sentence that goes over two lines, that's a good sign it's too long. Short sentences are easier to absorb and are likely to keep your audience reading. The same principle holds true for your paragraphs. Long, chunky paragraphs look intimidating on the page and can turn a visitor away from reading your blog post. Instead, break your writing up into short, easily digestible paragraphs. You can use headings and sub-headings to help break things up. These tricks will make your content easy to read and help to keep readers engaged. If you're going to make money from your blog then you'll need to think carefully about exactly how you want to monetize it. There are multiple ways you can do this, and how you monetize will depend on your blog's niche, how obtrusive you want any advertisements to be, and how much money you want to make. In this section we are going to outline some ways of monetizing a blog to help you figure out the best way to start making money. This is probably the most popular kind of monetization used on blogs. The concept is pretty simple. For pay per click ads, you'll earn money every time someone clicks on the ad placed on your blog. You and the advertiser will agree ahead of time on a cost per click, and you'll find that products and services that cost more usually correlate to a higher cost per click. Predictably, pay per impression (sometimes also called cost per mile) advertising pays you depending on the number of impressions (views) your page gets. You'll usually be paid for every 1,000 impressions. Both pay per click and pay per impression ads can be banners or text ads. 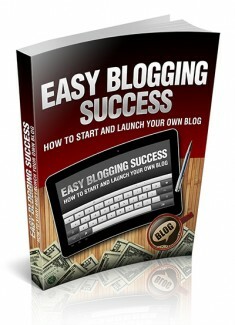 As you can imagine, you'll generate more money if you have lots of traffic to your blog. Without a fair amount of visitors, you may only be making pennies. It often takes time to build up a blog following though, so don't get discouraged if you're not making good money immediately. Direct advertising will look very similar to pay per click and pay per impression ads to your readers, but it works differently for you. Instead of earning money based on views or clicks, you sell advertising space at a set price to advertisers. You and the advertiser will agree on a set price and how long the ad will run for. If your blog has a lot of traffic, you can negotiate for a higher price. You can often sell ads directly to advertisers, but there are also marketplaces (such as BuySellAds) that can connect you to advertisers. These marketplaces will usually take a commission, though, so if you can work it out yourself, that's generally the better route. Many products and services offer affiliate programs. If you sign up as an affiliate, you'll earn a commission for every sale you generate for that business, which can be either a set fee or a percentage of the sales price.